The Plant: The Flora of North America, Vol. 25 (2002), describes Bigtop Love grass as southern love grass with habitat on sandy clay soils. Current populations are known from Washington DC south to Florida and West to Texas. 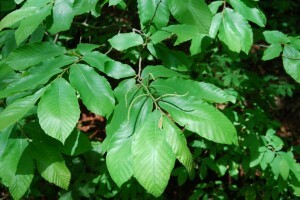 The New Jersey Natural Heritage Program lists the plant as Endangered with a S1.1 rank (one occurrence). It has a G5 (stable) global ranking. Significance: New locations in New Jersey have been discovered for this unusual grass. Big-top Love Grass has new State locations in the vicinity of Mays Landing, Atlantic County. A third cluster of plants was discovered 9/2011 in Downe Twp Cumberland Co. Once thought to be restricted to one population in Vineland Cumberland County, it has now been confirmed at three new populations. Ted Gordon and Joe Arsenault collected specimens of this southern grass in Mays Landing as early as 1996(?) along a gas line right of way (JRA,#2369). A second discovery found a distinct population expanding the know locations by two in the Mays Landing area (JRA #2195). The Downe Twp population expands the species southwest of its original site description. Mr. David Snyder, the NJ Natural Heritage Program’s botanist, describes a population in the City of Vineland as the original documented site. Unsubstantiated reports from other botanists indicate it may be elsewhere in Cumberland County, outside the City of Vineland. The Downe Twp discovery verifiies, at least in part, the earlier unsubstantiated Cumberland Co claims. Field work completed by David Snyder in fall 2013 found additional populations in what appeared to be native roadsdie habitats. A report has also been made from Cape May County. Description: Eragrostis hirsuta is an unusual love grass. It is best identified bythe panicles that can exceed 1 m. The species is also identified by few flowered spikelets, 2-4 (5) Fernald (1950). The Flora of North America, Vol. 25 (2003), describes its habitat in the United States as sandy clay soils. Current populations are known from Washington DC south to Florida and West to Texas. The New Jersey Natural Heritage Program formerly listed the plant as a S1.1 (one occurrence) with a G5 (stable) global ranking. The current State ranking is S1 based on the new populations in Cumberland, Atlantic and Burlington Counties. As more populations become established the ranking will probably drop to refelct the rapid spread in our drier habitats. Its presence in New Jersey is an enigma. The NJ populations extend its range beyond its known southern US locations. The method of distribution into the state is unknown, but its presence around utility lines and rights of way may indicate a transfer via utility workers, but this is just speculation. Regardless, be aware. Look for this new and unusual grass to spread now that it has arrived. Specimens: J.R. Arsenault, #2195, October 2, 2009; dry open sand soils E. 40 Wire Road/southUS Rt 40 adjacet to detention basin with Panicum virgatum, Eragrostis spectabilis, Andropogon virginicus, Mays Landing, Atlantic Co, NY; J.R. Arsenault, #2369, September, 1996(? ); moist sand along gas line right of way near bend in Lowell Lane, Belcoville, Mays Landing, Atlantic Co, NJ. J.R. Arsenault, 2/2011; revised 11/25/2011. The Plant: Chinquapin is a rare shrub scattered in New Jersey. An endangered plant worthy of note, this Castanea shrub occupies the same shrub strata as scrub oak (Quercus ilicifolia) and mountain laurel (Kalmia latifolia). It was once though to occur in small discrete populations from Hunterdon County south in the Delaware River valley. 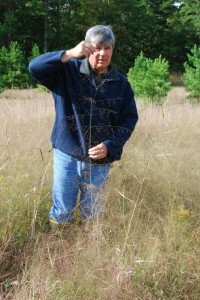 Recent botanical work completed by Ted Gordon and Joe Arsenault identified a large population in Salem County where the shrub is a major component of the forest understory. The land within the eastern Burden Hill forest is a place this shrub thrives. It occupies a portion of all oak-pine woodlands growing on Bridgeton Formation gravel and is a patch dominant on land west of Telegraph Road, Alloway Township. A recent trip to Burden Hill on May 21 2011 identified a new cluster of plants on the eastern edge of suitable terrain and expanding our understanding to the local distribution. The specimens where near a Thundergust Pond Fish and Wildlife Management Area parking lot, north of Spillway Road. Description: Castanea pumila is an unusual shrub that can exceed 3 m. The species is identified shallow toothed leaves and panicles at the terminal bud of last season wood. Mary Hough (1983) identifies Hunderdon County as the northern extent in State. Populations are known to this author to persist in Hamilton Township, Mercer County; East Greenwich Twp Gloucester County; Weymouth Twp Atlantic County and the vicinity of Burden Hill, Alloway/Quinton Twps Salem County. Fernald (1950, Gray’s 8th edition Manual of Botany) describes its habitat as dry woods and thickets. Current populations are known from Texas to Florida north to New Jersey. The New Jersey Natural Heritage Program lists the plant as a S1 (endangered, 1-5 occurrences) with a G5 (stable) global ranking. Significance: Its presence in New Jersey marks to north extent on North America’s Coastal Plain and nearby Piedmont areas. The Salem County-Burden Hill populations are well established within a large (~15,000 thousand acres) stable forest with this rare shrub species as an important understory component. The Plant: The Flora of North America, Vol. 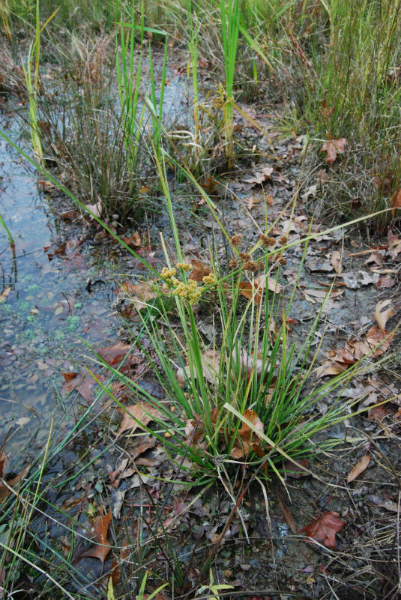 23, describes Marsh Flat sedge as a plant occupying moist soils with documented populations from Massachusetts to Florida west to the southern Plains states as far as Texas and Oklahoma. Current populations are known from all of the listed states. 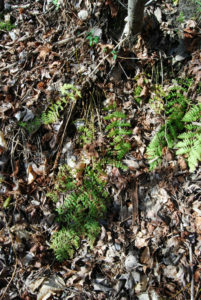 The New Jersey Natural Heritage Program lists the plant as Endangered with a S1.1 rank (one occurrence). It has a G5 (stable) global ranking. Description: Cyperus pseudovegetus is a distinct flat sedge. The species is identified by densely clustered flowering occupying a terminal position on fertile stalks. Fernald (1950) describes the species as a perennial with triangular culms and leaves with a distinct long keel. Spikelets are numerous with greenish heads that was a reason an early name was C. virens Michx. The Flora of North America, Vol. 23 describes its habitat in the United States as moist soils and Fernald just describes wet places. The recent Salem County occupies an Inner Coastal Plain setting, on the edge of a manmade pond excavated into hydic Fallsington sandy clay soils. This manmade depression receives periodic inundation and the edge is a function of the season rains. Those looking for the plant may add this much wetter habitat to the search criteria. Current populations are known from throughout its range. A recent observation was made by the author in Leesburg Virginia on the edge of the Piedmont physiographic region. The New Jersey Natural Heritage Program lists the plant as a S1.1 (one occurrence) with a G5 (stable) global ranking. 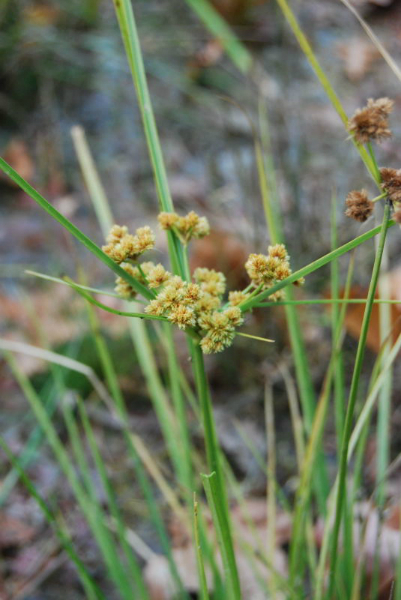 Significance: A new population has been discovered for this endangered sedge. The marsh flat sedge has been discovered (2012; observed 2013) in a newly excavated pond north of the village of Alloway, in Alloway Township Salem County. The species had been observed in Burlington, Ocean and Salem Counties, but it appears the newly discovered plants may be the only extant population. Mr. David Snyder, the NJ Natural Heritage Program’s botanist, indicates the original find was almost a century ago, just “up the road” in the Riddleton area. That population seems to have been absorbed by the surrounding forest and lost to modern day botanists. It was found by Ted Gordon and Eugene Vivian around 1992 in the Mayetta section of Stafford Township Ocean County. Mr. Gordon reports that repeated visits to the Ocean County population have failed to relocate the plant. A more recent sighting was made by David Snyder in 2009 when a robust population was discovered in New Gretna, Burlington County. Apparently this species occupies early disturbed habitats and like many flat sedges fades into the sea of succeeding perennial species that follow new disturbances. 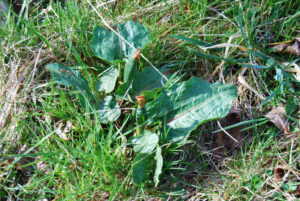 Habitat for the plant appears to be widespread yet the plant re-emerges only in places that serendipity could predict. The new population provides a continued presence in the state. 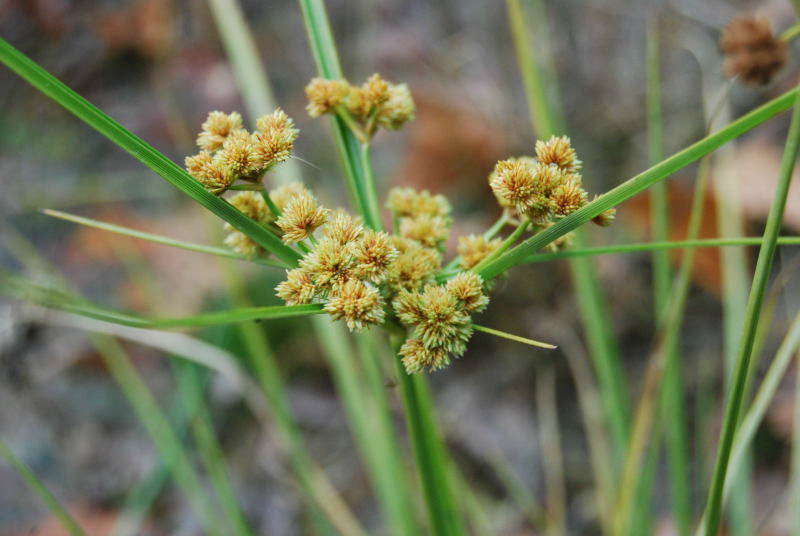 Like many early succession species, especially those in the genus Cyperus, only diligence and continued observation can be the way the plant is located. Specimen: J.R. Arsenault, #2423, November 10 2011; inundated pond edge NW Alloway Lake along the abandoned Quinton-Swedesboro Railroad with Scirpus cyperinus, Juncus acuminatus and Ludwigia alterniflora.